IK Multimedia is proud to announce we have partnered with Samsung to bring the mobile music revolution to select Android devices. 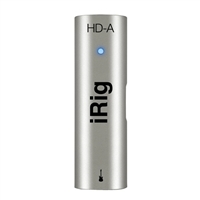 iRig HD-A digital guitar interface delivers outstanding sound quality and compact design, and pairs with the new AmpliTube for Android app on select Samsung devices. Featuring professional-grade, 24-bit, 48 kHz A/D converters, a high- quality input jack and adjustable preamp gain, iRig HD-A ensures the highest-quality input signal to get the most out of the AmpliTube app. The app, AmpliTube for Android allows guitarists to plug into their Samsung device and play through incredibly accurate recreations of some of the most famous guitar and bass amps and stompboxes of all time. Users can practice, play and record with stunning realism on a device thats always with them, perfect for whenever inspiration strikes. Previously not possible on Android, this app takes advantage of the new Samsung Professional Audio features available on the new Samsung GALAXY Note 4 and GALAXY Edge, and soon to be available on the previous Samsung GALAXY S5 and GALAXY Note 3. To promote this new system, every Samsung GALAXY Note 4 and GALAXY Edge comes with a pre-installed link to AmpliTube LE as a part of the GALAXY Gifts App package.